Every day at Timberlink we transform sustainably grown plantation pine into quality timber products. Our products can be used to make almost anything from a simple pallet to an 8-storey building. And the best thing? Every cubic metre we make has removed 631kg of CO2 from the atmosphere. 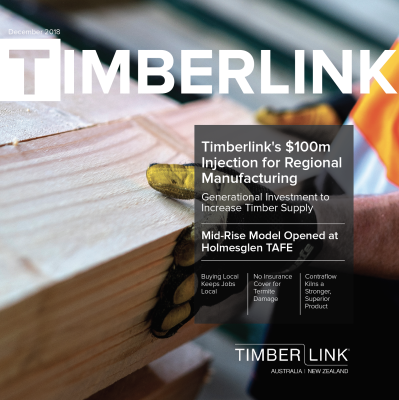 This is why timber has a critical role to play in sustainable construction and manufacturing in Australia. It drives us to ​continually invest in our sawmills, upgrading and installing cutting edge technology so that we can efficiently produce the quality our customers expect. Our focus is on structural timber for wall frames and roof trusses like our termite resistant Timberlink Blue and our outdoor structural Timberlink Green with the latest enhancement of Low Odour for decks and pergolas. We also make super straight Timberlink Arrow Posts, Timberlink Decking, fencing, sleepers, appearance DAR lining boards, mouldings and woodchips. By cutting a range of products from each log we ensure that we can efficiently supply products for many different uses. Our three regional sawmills, in Tarpeena, Bell Bay and Blenheim, are supported by our national distribution network. This gives our customers flexibility and fast turnarounds supported by an experienced sales and service team. At Timberlink we are committed to our key values of safety first, openness, fairness, resilience, respect, and integrity. We think that what we have is unique in our industry. With a secure access to sustainably grown plantation logs and committed long term shareholders, we are big enough to be relevant, yet small enough to know our customers. Our most important responsibility is returning our employees home safely. Every day. Our product range is not complicated. ​We make plantation pine products of a consistent quality for building and manufacturing use. We invest in the latest technologies so we produce timber of a consistent quality, as efficiently as possible, to keep our customers competitive. 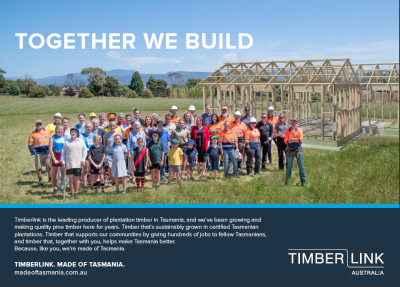 ​how Timberlink is, and always has been, made of Tasmania. For all sales enquiries please phone 1800 088 135. We are a wholesaler and don't sell direct to the public but our customers would love ​to help you.